One thing I’m finally getting pretty good at is baking bread — specifically, baguettes. 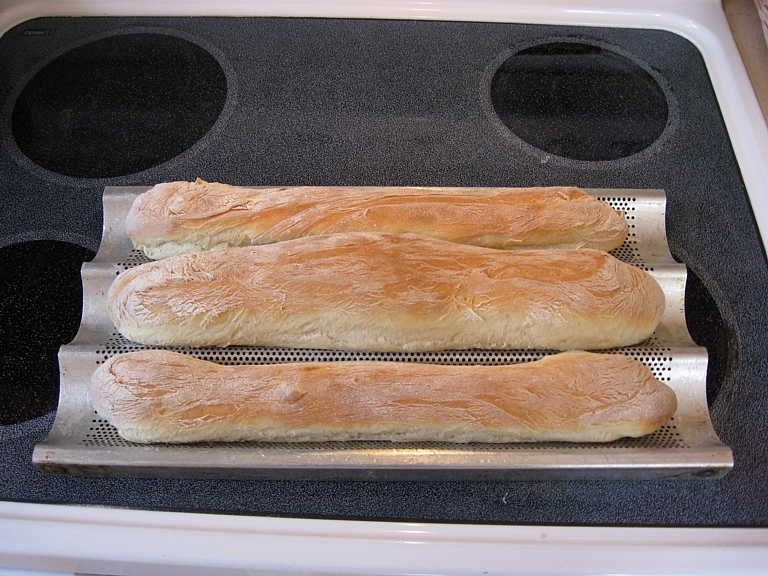 Good friends of ours gave me a baguette pan a few years ago after we returned from my first trip to France and began raving about the baguettes. If you have been to France you know what I mean; if not, you don’t. There is something mystical about a daily trip to the boulangerie for fresh baguettes. Once we were picked up at a Parisian train station by our hostess, who made a mad dash through Parisian traffic to get to her favorite shop before dinner. They were out of baguettes and she had to settle for Italian bread. What to do for dinner? What kind of leftovers would there be at breakfast? Quel horreur! On that same trip we stayed in a gite (rural guest house) in a tiny village in the Loire valley. Probably fewer than 200 people lived there, but their bakery opened early each morning with fresh-baked loaves. The aroma was intoxicating, and the daily trip quickly became part of my routine. The best baguette I have ever made is inferior to the simple ones churned out by thousands of little shops across France. (Those buttery crusts! Those gossamer insides!) Maybe I just don’t have the right flour. Or the humidity isn’t right, or I’m not wearing a beret. Or something. But I like to do it. It connects me, if only briefly, to the shops and smells of France.